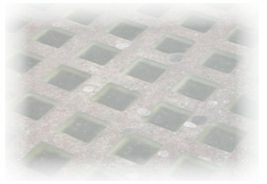 Pavement lenses, also known as pavers or pavement lights are glass blocks that are pressed in clear flint glass. The most common size in use is a 4in (100mm) square lens pictured, supplied 1012 per pallet, although many more exist. Special size repair lenses are also available for certain applications. Please note that as glass manufacturers to numerous different industries we produce the glass lenses only and sell in bulk to maintenance companies and installers. We do not supply or install the concrete or metal framework also required and cannot advise on this. For specialist applications, such as the restoration of listed buildings, Nazeing Glass can produce glass blocks to specific designs and sizes. Original samples and preferably drawings are required for this kind of work, which will need special moulds made to the required design. For more information please see call or email. Standard pavement lenses and cell wall blocks for use in secure locations are usually available from stock. Other more unusual sizes are available to special order and may be subject to minimum order quantities. For a full list click/tap here. Most standard sized glass wall blocks are mass produced ranges imported into the UK in volume and available through large DIY chains, builders merchants, etc. We do undertake processing of these standard blocks (sandblasting, cutting and/or application of protective coatings etc.) for various customers, but do not supply the blocks themselves.